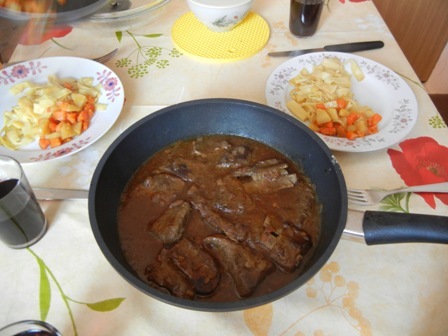 Whenever I visit my family in Trier, they spoil me with super delicious food, mostly game dishes. Heinz is a passionate hunter and he reserves only the best meat for me. This time young roast venison was on the agenda = my plate. I tell you, it was awesome. 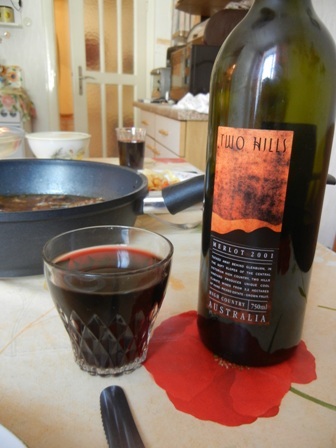 I washed the venison down with a ‘2001 Two Hills Merlot’, which is still a drinkable wine. 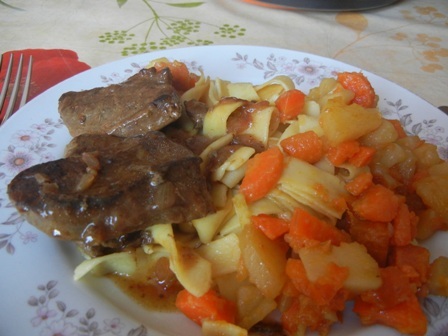 The softness of the Merlot tannins went well with the savoury taste of the young game. 2. because I am convinced that in the next couple of years some of the Canadian wines will hit international wine markets and might be more readily available to consumers outside the Americas. The evening before we visited Closson Chase Vineyards, we had a glass of its 2009 Chardonnay which tasted strange, very strange. In hindsight I think it was off. However, in some of the brochures collected from the Picton tourist office I had read a story about Deborah Paskus, the iconoclast viticulturist and celebrated wine-maker of Closson Chase, which led me to believe that we have to go and see the place with our own eyes. Closson Chase was established in 1999. It produces exclusively the Burgundy varieties Chardonnay and Pinot Noir wines, some from its own vineyards, some from leased properties nearby. We visited Closson Chase on the 2nd of August, a beautiful summers day. 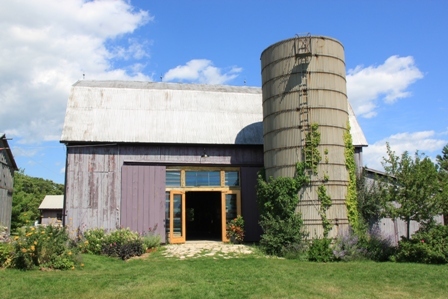 The cellar door is located in Hillier on the Western side of Prince Edward County. limestone rich. The low yields and the French inspired vinification and barreling are responsible for the superior quality of its wines. 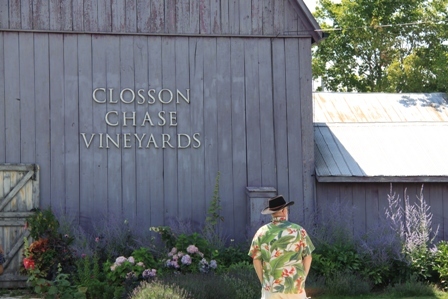 In 2009, Jancis Robinson, the guru of the international wine circuit, called Closson Chase Vineyards one of the two finest producers in Ontario. 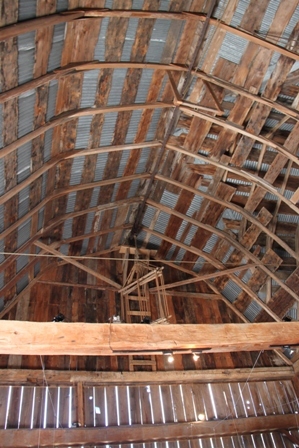 The cellar door and tasting room is housed in a century old barn which has been restored. The day we visited an exhibition of moden art was shown on the premises. 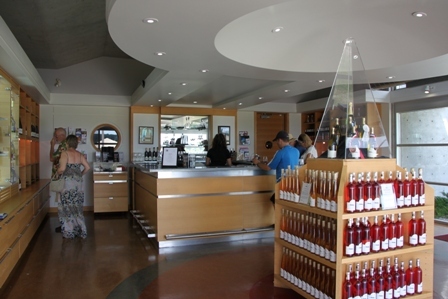 The tasting at Closson Chase Vineyards is pricy in comparison with other place on Prince Edward County. For a tasting of three wines one had to pay 12 C$ (uff!!!). We drank two glasses of unoaked Chardonnay, and one glass of Pinot Noir. The garden ist just wonderful located on the back side of the old barn. We sat their completely satisfied. The wines were stunningly good. We bought a bottle of Chardonnay and one Pinot Noir to take home to Bangkok. Only one bottle “survived” the journey. More about the Pinot Noir when we have it with a meal. Closson Chase is a must visit if you are in Ontario. 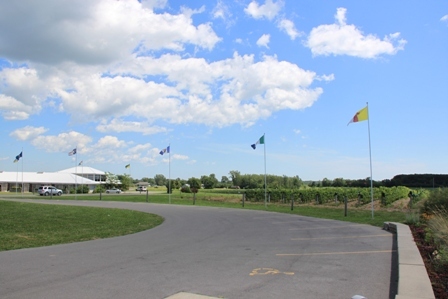 Huff Estate is one of the big ventures in the wine industry of Prince Edward County in Ontario. 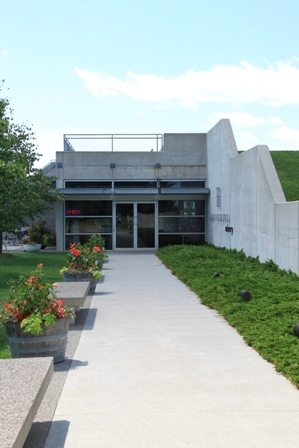 It not only produces wines but offers also a modern style country inn and an art gallery. Visitors just drive up and enter a spacious estate for the high end consumer of wine and culture. We came only to buy a couple of bottles of the award winning Chardonnay wines Huff Estate has produced in recent years. I had tasted a glass of the Chardonnay while dining in Picton a day earlier and liked to drink some more of it. We did not linger around although the place was very inviting, I must say. 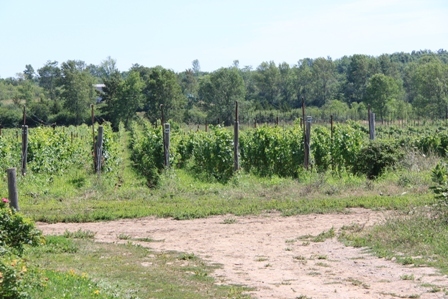 Lanny and Catharine Huff, both natives of Prince Edward County, started their vineyard in 2001 on a 150 acres lot. The winery followed in 2004. In 2006 the Inn was constructed and in 2009 the gallery was added to the estate. Huff Estate has two main vineyards, the South bay vineyard and the 62 plus 1 vineyard (15 acres). 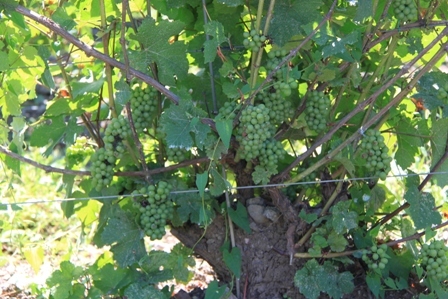 The grape varieties grown include Merlot, Cabernet, Pinot Noir, Gamay, Riesling, Chardonnay, Pinot Gris, Frontenac and Vidal. Frédéric Picard, who originates from Burgundy, France is the winemaker. Doug Gyde and Alex Hunter are the vineyard managers. 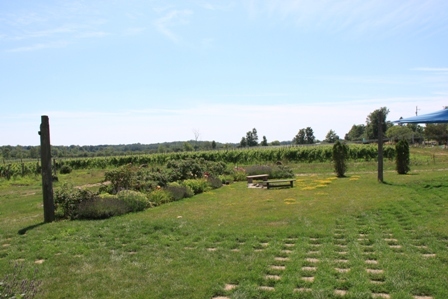 Huff Estate produces high quality wines which reflect the specific terroir and climate of Prince Edward County. I love their Chardonnay wines. The two Chardonnay wines are still in Germany. I will bring them to Bangkok in a few days time and then will let you know what they taste like. Unfortunately wine bottles are rather heavy. Among the four of us we were able to carry six bottles with us. Some of them I had to leave behind in Germany, two of them made it to Bangkok. I have already written about Marynissen Estates, the lovely winery in Niagara-on-the-Lake. About the other four producers I intend to post in due course. The two bottles in the middle of the above picture are from Huff Estate in Prince Edward County. 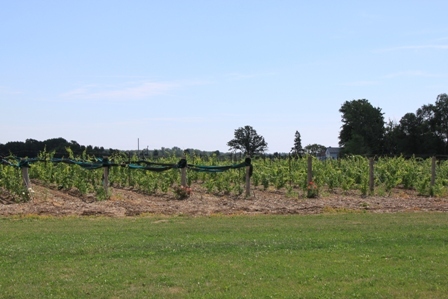 Also Del Gatto Winery is located on this island, as is Closson Chase Vineyards and The Grange of Prince Edward County Estates. I had the great opportunity to visit all of them and taste some of their wines. Great stuff what the Canadian wine-makers produce, I must say. Stay tuned for more stories on Canadian wineries. Many of my friends in Trier just love off-dry Riesling wines. One of them is my old high-school friend Juergen Olk who lives in Eitelsbach. 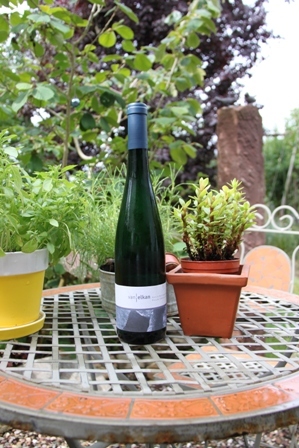 When we visited him and his family in July he produced this wonderful bottle of Riesling from the Ruwer valley. The Ruwer river is a tributary to my beloved Mosel. 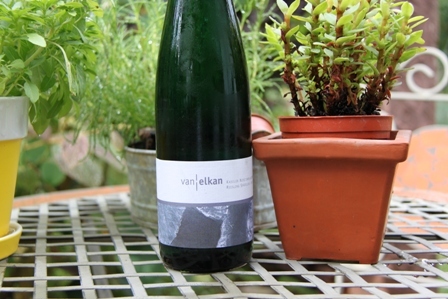 I did not know the Van Elkan winery. Although I am not that much a lover of semi-dry (or semi sweat) wines, I must say that I liked this wine. Christina and Marco van Elkan started their venture into the wine industry in 2003. Their philosophy of low yields and minimum intervention pays off. The quality of their wines is already well recognized. 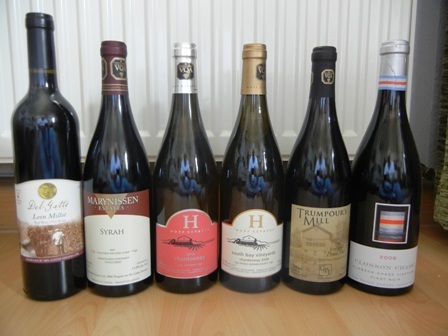 The van Elkan wines are reasonably priced (7.00 to 9.80 EURO per bottle). I wonder what the dry wines of the van Elkan family estate taste like. Something to explore further. How to say good bye to Germany – would a Riesling do? 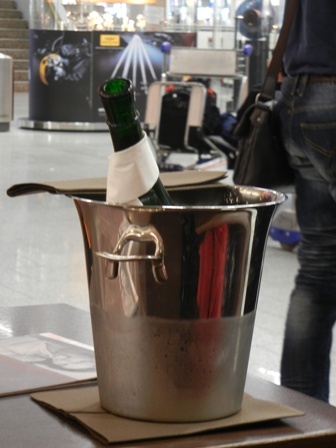 We left Germany in style, will say, we had a bottle of German Riesling while waiting for our plane to Bangkok. 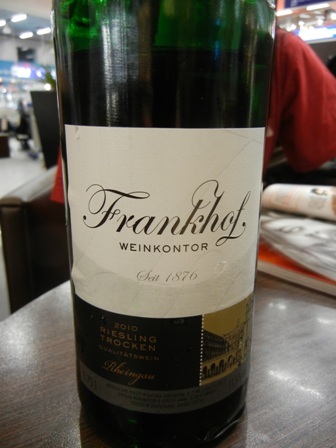 A bottle of ‘2010 Frankhof Weinkontor Riesling’ was my choice. I had never heard of this producer. Later I found out that it belongs to the Steigenberger Hotel chain. In 1873 a wine cellar was founded in the basement of the Frankfurter Hof hotel. Albert Steigenberger bought the place in 1940 and made it his flagship hotel. The wine is a good specimen representing German Riesling quite nicely. It is nothing special though, just a good Riesling, fresh and full of lemon flavours, in short the way I like it. But the fact that we had a good Riesling served in a wine cooler relaxed us somehow. We could conclude our summer holiday in a setting which reminded us about the many great wines we had tasted, the places we had visited and the people we had the great opportunity to meet. Summer 2011 was wonderful for our family; we had a great time in Canada and Germany. Mongolia is a great place. The capital city Ulaan Baatar is humming away with energy. Many “watering holes” are available for the thirsty (there is food for the hungry as well). 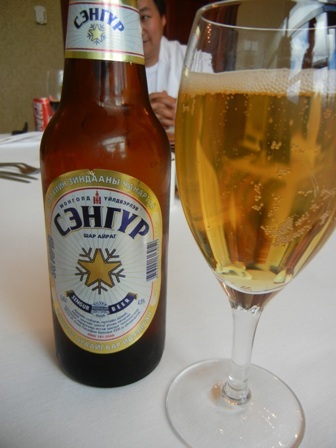 Since our host is (among others) also the president of the Mongolian beer association, we indulge in this drink (plus some good vodka). 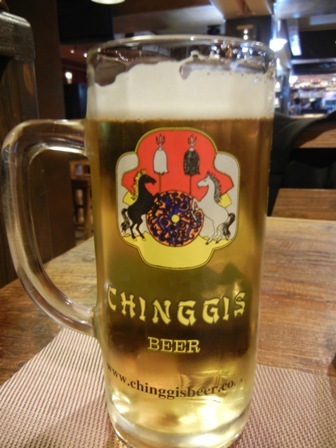 Two of the many beers I want to mention here, first, the Sengur beer and second the Chinggis beer brand, are both very delicious. Even after excessive amounts the “digestibility” is just perfect. This country seems to be a haven for beer drinkers. You are currently browsing the The Man from Mosel River blog archives for September, 2011.